Akhenaten was, without a doubt, one of the most enigmatic and mysterious Pharaohs to rule over the lands of ancient Egypt. He was one of the most controversial and influential Pharaohs of Egypt and is considered by many as one of the world’s most revolutionary religious innovators. He ruled over the land of the Pharaohs in the Eighteenth dynasty and he was the father of Tutankhamun, and husband to Queen Nefertiti. Interestingly, he was known before the fifth year of his reign as Amenhotep IV, ruling over Egypt for 17 years. Akhenaten is especially noted for abandoning traditional Egyptian polytheism and introducing worship centered on the Aten. The Aten, or commonly referred to as the ‘Sun Disk’ is referred to, in ancient texts, as a deity in the The Story of Sinuhe from the 12th dynasty, in which the deceased king is described as rising as god to the heavens and uniting with the sun-disk, the divine body merging with its maker. By analogy, the term “silver Aten” was sometimes used to refer to the moon. The solar Aten was extensively worshiped as a god in the reign of Amenhotep III when it was depicted as a falcon-headed man much like Ra. Akhenaten claimed, “There is only one god, my father. I can approach him by day, by night.” This was a very, very strange statement for the time. Akhenaten could have been the first monotheist in all of history, a precursor to Abraham, Isaac, Jacob and Muhammad as prophets who worshiped one god. According to Egyptian Mythology he descended from the gods who arrived on Earth at the time of Zep Tepi and until today, people still believe that this Pharaoh did, in fact, come from the Stars. The Zep Tepi is now considered by some researchers as a historical fact. According to the “Pyramid Texts”, there was a period that emerged from the primordial chaos and the way gods ruled the earth. This period is called “Zep Tepi”. According to several researchers, among them Armando Mei, Zep Tepi is a historical period that can be traced back to a specific date, 36,420 BC. According to writings by Akhenaten and poems that were written about him later on, he was visited by beings that descended from the sky, who told Akhenaten what he needed to do, and perhaps this is why he removed all other symbols of other gods from Egypt and implemented most of the changes he went on to do. An early inscription likens him to the sun as compared to the stars. Akhenaten, upon becoming Pharaoh ordered all the iconography of previous gods to be removed. He only allowed one emblem, which was a sun emblem, literally a sun disk with curious arms or rays pointing down. 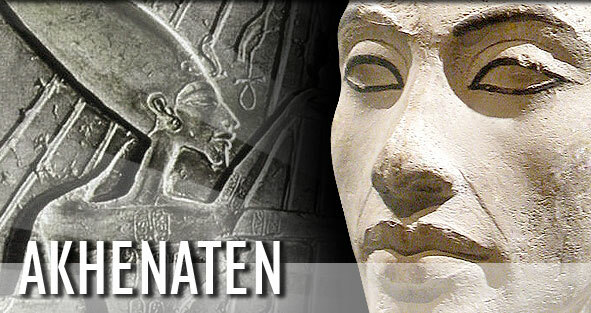 Akhenaten claimed to be a direct descendant of Aten and like any other pharaoh Akhenaten regarded himself to be divine, he was a God, but not only did he believe himself to be a god, the whole nation saw him as a god and worshiped him like one. During his time as Pharaoh Akhenaten made numerous changes but he also ordered the construction of a new capital city which he called Amarna and he dedicated it to the sun. Akhenaten spent the next ten years there and in that time he instituted changes in art and culture and one of the most notable changes were how he would be publicly depicted, and this was important because in Egyptian iconography, Pharaohs are depicted as these triangular shaped beings, strong shoulders, and these very skinny waists, so basically, they were depicted as being strong, like heroes, this would reflect power and it was very important but Akhenaten would go on and shows himself perhaps as he really is, a strange look, unlike other Pharaohs. Interestingly, it is worth mentioning that the idea of Akhenaten as the pioneer of a monotheistic religion that later became Judaism has been considered by various scholars. One of the first to mention this was Sigmund Freud. Others have likened some aspects of Akhenaten’s relationship with the Aten to the relationship, in Christian tradition, of Jesus Christ with God – particularly in interpretations that emphasize a more monotheistic interpretation of Atenism than henotheistic. Donald B. Redford has noted that some have viewed Akhenaten as a harbinger of Jesus. But the story behind Akhenaten is far more profound than what we could ever imagine. Historian James Henry Breasted considered Akhenaten to be “the first individual in history,” while stating that he was one of the first, if not the first monotheist, romantic and scientist.